Russia is offering a $100,000 reward to anyone who can de-anonymize Tor. The Snowden revelations may have been shocking, but you can’t beat that user bump. If you want privacy while you’re browsing the Web, Tor is a solid anonymity service to turn to. It’s a network that uses thousands of volunteer relays worldwide to bounce Internet traffic around until you can’t tell where it originated. Not surprisingly, there are a lot of groups (mainly governments) that would rather this system not work. The Russian government is even offering 3.9 million roubles—about $111,000—to the person or research group that can figure out who uses Tor. Tor seems like it’s everywhere lately. Information from NSA documents obtained by Edward Snowden indicates that the NSA devotes significant resources to trying to crack Tor and de-anonymize its users, even though the U.S. Navy invented Tor and the federal government gives it financial support. And German journalists recently discovered that the NSA considers people who facilitate/use anonymizing services like Tor to be “extremists.”ProPublica realized that the NSA was using Tor’s list of directory servers to take names. Merely searching for high-security services like the operating system Tails draws NSA scrutiny. 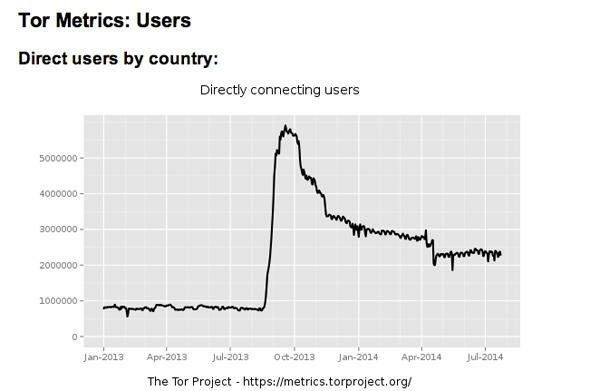 According to the service’s own data, Tor had a fairly steady number of users—a little less than 1 million per month—before Snowden’s whistleblowing began. Usage spiked dramatically in September 2013, reaching almost 6 million users at its peak. Since then use has fallen gradually to about 2.5 million monthly active users now. You have to be a Russian citizen to submit an MIA proposal, so everyone else is out of luck. But if you’re a privacy advocate, or just want to know that it is possible to achieve anonymity online, you probably should be using Tor instead of working against it anyway.